The evidence to support the effectiveness of specific psychotherapies varies. The evidence for IPT and psychodynamic therapy focuses mostly on depression and anxiety; CBT has been used more widely and tested in more populations, including people with ADHD and PTSD. Although this chapter briefly reviews three psychotherapies, there are several other types of therapy that may benefit consumers but have undergone less empirical testing. Some researchers have noted the lack of information on the processes and outcomes of psychotherapy in typical treatment settings and have suggested that further research into usual care practices may identify promising treatment approaches (Garland et al. 2010a; 2010c). The variability in the evidence for different types of psychotherapy, as well as the limited research on the effectiveness of some types of psychotherapy, has several implications for quality measurement. As with the development of any quality measure used for accountability, the measure developer and user would need to assess the strength of the evidence for a particular psychotherapy when applied to a particular population. Further, much of the evidence on psychotherapy has been conducted in controlled settings. There is limited evidence on the extent to which a particular psychotherapy can be adapted while still achieving positive outcomes. We also recognize that some of these psychotherapies share common elements (Chorpita and Daleiden 2009). There is a large body of literature to suggest that common factors and common elements across different types of psychotherapy are strongly associated with outcomes independent of the type of treatment being delivered (Laska et al. 2013; Lambert and Barley 2002). Common factors include the ability of the provider and consumer to agree on goals and collaborate toward reaching those goals, the provider's ability to demonstrate empathy, and the development of a strong therapeutic alliance (that is, the quality of the bond with the therapist and whether the therapist shares his or her therapeutic objective) (Bickman 2005). Common treatment elements are the shared therapeutic features of different types of psychotherapy. These include elements such as the use of relaxation techniques, psychoeducation, and cognitive coping skills (Laska et al. 2013). For example, a review of evidence-based interventions for treatments of anxiety in children found that most offered psychoeducation, exposure, and relaxation (Chorpita and Daleiden 2009). 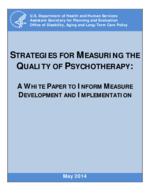 Thus, although this chapter describes some of the specific types of psychotherapy as targets for quality measures, it could be possible to measure whether some of the common factors and treatment elements are present and result in positive outcomes. The current evidence base on psychotherapy has not given sufficient consideration to the needs of people with co-occurring disorders. Many studies of these psychotherapies have focused on single diagnostic groups, so the outcomes of psychotherapy for people with multiple mental health problems or both mental health and substance abuse problems is often unclear. Existing clinical guidelines do not provide consistent recommendations on the treatment of individuals with co-occurring behavioral health disorders or those with comorbid physical health conditions. Finally, disparities in care based on race and ethnicity have raised concerns about the need for adapting evidence-based treatments to specific cultural contexts and beliefs (Sue et al. 2009). Guidelines about cultural competency in treatment approaches recommend that providers consider such issues as cultural beliefs that may pose barriers to care or contribute to differences in expressing symptoms (for example, AACAP 2013); however, the question of whether evidence-based treatments should be adapted to specific cultural needs is still debated (Bernal et al. 2009). Additional research on the effectiveness of psychotherapies among diverse populations would be beneficial.